There are a lot of prepper books out there to choose from. Occasionally we are going to review a book here that is highly recommended. Some of these are books that helped me get through some hard times and learn a lot of things I could never do before. 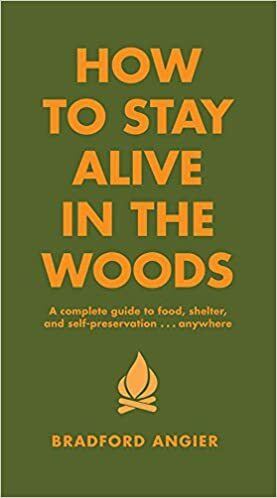 This post’s selection is “How To Stay Alive In The Woods” by Bradford Angier. This was a new author to me, but my father was familiar with his books as they related to the whole “back to the land” movement. This book has a little bit of everything in it, and that is what makes it great. In this volume is a lot of valuable knowledge to get you out of some very tight circumstances. The book is organized into Chapters and Sections based on basic needs and skills. I think this is a good approach. You may not really have much need for some sections especially if you have been a survivalist or prepper for many years. On the other hand, I have found that there is a lot of advice in this book that thinks outside the box so it is worth looking at all chapters because you may learn how to do something faster or better. Talks about how to find and capture food. There is also an edible plant guide. This is minimal, but it is helpful and may encourage you to explore your own flora and fauna a bit more. There is a lot of food out there in the wild in a lot of places. You just have to know how to be patient and how to get your hands on it. This book definitely helped inspire a previous post I did on cooking without pots and pans in the wilderness. These methods are not ideal of course, but they are good to know just in case you find yourself in an extreme situation. This is where you learn how to make a wilderness shelter, build a fire, and Bradford talks about clothing choices for survival situations. It has been a long time since my college orienteering class, and I can tell you I would not be the best at this now. This book discusses how to handle a situation where you are lost. Signaling is discussed very in depth. I have to say that some of the more complicated signals would be challenging for the inexperienced and stressed out person wanting to be rescued. A lot of first aid kits are severely lacking when it comes to backwoods medicine. This section addresses what you should have with you. I like that he covers topics such as the temptation to cover too much ground and how exhaustion can lead to disaster. Watching out for wildlife is another major concern. There are plenty of people that live in suburban and urban areas that have large predators in their area. You need to be prepared to deal with a wild animal if you find yourself out in the bush. Chapter 24 is titled “Being Ready”. I love the list of supplies they give for a serious expedition. This is a Chapter that should be reviewed several times because it has a lot of preps that everyone should have. A list is a good way to get started evaluating what preps we have and what is lacking. I like reading others lists because it also makes me think about if I would actually use everything I have in a bag when out in the bush. It is easy to pack things that are luxuries and look over some important things that can make a big difference in your chances of survival. This book has a lot of graphics to help explain things. To some, this may be a bit of an old-school book, but that is part of the appeal to me. Bradford covers some rough situations. The graphics are enough that it helps to keep interest in those that are more visual learners. I find that you really have to keep coming back to this volume to truly appreciate it. You don’t have to read it all at once to learn a lot. You may be advanced in restarting but not know that much about wilderness fishing techniques, so you will be more interested in that Chapter. This text is easy to follow and understand. Those that want to teach their kids advanced survival skills may want to utilize portions of this text. Eagle Scouts and other troops could benefit from this book as a reference and training tool. This is a very interesting book cover. It is a hardcover that is rubberized and waterproof. It looks cool on your bookshelf, and I like it when a survival book takes steps towards being more rugged. This is a real bargain for the amount of knowledge within the pages. Just remember to check that you are getting the hardcover edition when ordering. There is a kindle version too as well as a paperback. The price difference is not enough to make the paperback worth it compared to the hardcover. While a lot of us will never use many of the skills in this book, they are valuable skills to know if you really want to be a true survivalist. Preppers and survivalists often get thrown into the same category, but they are different in some ways. A prepper maybe someone that has no intention of every roughing it in the bush or backpacking. A survivalist wants to know how to get out of the worst of the worst situations and do everything with very little supplies. I think both preppers and survivalists can learn some handy tips in this book. Looking for more prepper book reviews? Get Backdoor Survival LIFELINE!